Visit Fussen in Germany and discover beautiful nature, history and the most famous German castles, Neuschwanstein and Hohenschwangau. The famous Royal Castles are only a few km away. No wonder, King Ludwig II is kind of ubiquitous in Füssen. Fussen (the German spelling is Füssen) is often called the romantic soul of Bavaria. Although the medieval city is a worthy tourist attraction itself, Fussen's most claim to fame is its location in the kings nook (Königswinkel), and its closeness to King Ludwig's dream castle. One of the most scenic German holiday routes, the romantic road (Romantische Straße), from Fussen to Würzburg) starts (or ends) here. You should really take a few days to explore the Romantic Road, it is indeed one of the best tourist attractions in Germany. Surrounded by rolling hills and green meadows, the peaks of the Alps rise dramatically south of Füssen. The scenery is just beautiful, especially on a sunny day. Here is all the information about beautiful Fussen, use the links below to hop to any topic of interest. Füssen's roots go back to the Roman era, when a settlement developed on the roman road Via Claudia Augusta. 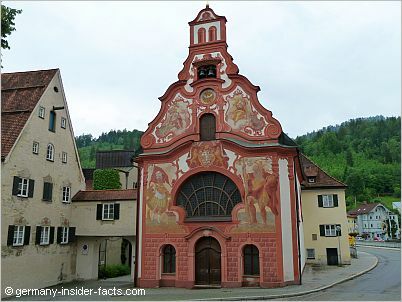 In the 8th century the Swiss monk Magnus laid the foundation for the Benedictine Abbey St. Mang. 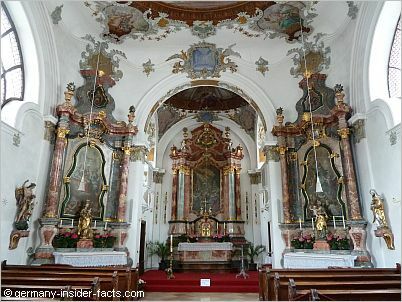 The baroque monastery you can visit today, was built from 1697 to 1727. Füssen's most prominent landmark, Hohes Schloss (high palace), was built from 1486 to 1505. 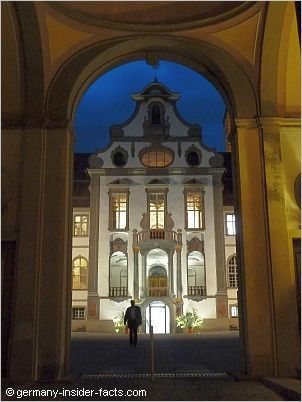 It was the summer residence of the bishops of Augsburg. Fussen was the cradle of lute and violin makers in the 16th century. The first European lute builder guild was founded here which helped the town to gain international importance. For everyone interested in history & culture Füssen's museums are a must see. Staatsgalerie (state gallery) im Hohen Schloss - See gothic paintings and sculptures, and the marvellous Rittersaal (knight's hall) with its beautiful carved wooden ceiling. The heritage museum in the Benedictine Abbey St. Mang - The abbey itself is a museum, including the baroque art work of the halls and the excarved medieval cloister. See an exhibition of historical violins and lutes, enjoy the baroque halls, and don't miss the Fussen Totentanz (dance of death) in the St. Anna chapel. The Totentanz painting by Jakob Hiebeler is the oldest "dance of death" cycle preserved in Bavaria. Both museums are open Tuesday to Friday (April - October) and on Fridays & weekends during the winter months. Population - Bevölkerung: 15,200; including residents of the incorporated towns Bad Faulenbach, Hopfen am See and Weißensee. Elevation: 800m above sea level. It is actually Bavaria's highest town with city status. For visitors who want a deep look into the history and culture of Fussen, museum guides can be booked in several languages (English, French, Italian, Spanish and Russian). Ask at the tourist information centre. A walk around the medieval town centre with the colourful gabled houses is really worthwhile. Adore the beautiful facades of the old houses, browse through a wide variety of shops, find that typical Bavarian souvernir, you will see history and King Ludwig II is always around you. While you stroll around, appreciate the views to the magnificient Hohes Schloss from different angles. Hohes Schloss and St. Mang abbey with their stunning museums. See the castle courtyard with the beautifully painted facades. Take your time to visit the museums. Spitalkirche Hl. Geist with paintings on the northern facade and beautiful frescoes and paintings inside. The original church and the spital burned down in 1733. Architect Franz Karl Fischer built this Rococo church in 1748/1749. The church is open daily from about 8:30am to 6pm. Festival Hall - The modern festival centre on the shore of Forggensee offers musicals, theatre, concerts and a fantastic view to the mountains and the king's castles. Forggensee was named after the town Forggen that "drowned" when the dam was built. Germany's largest man-made lake has some oddities to offer. The 15 km² lake invites for water sports, fishing, swimming, boating, sailing during the summer months. Comes autumn the lake falls dry. Only about 3km² water are kept to enable fishs to survive the winter. When the lake is (nearly) dry, you can walk around on the ground and see foundations of old houses and roads. You can even see traces of the ancient roman road Via Claudia Augusta. When the snow in the mountains melts in spring, Forggensee fills again for the summer season. There are one- and two-hour scheduled boat trips available to cruise on Forggensee from June to October. No, I don't forget to mention the biggest attractions, only a few kilometres from Fussen. Especially for visitors from abroad the Königsschlösser are the main reason to visit the Allgäu. Take a bus from the train station in Füssen to the bus stop Königsschlösser in Hohenschwangau. It takes only 8 minutes to get there by bus. Hohenschwangau castle is right in the middle of town. Here is more info on how to get to Neuschwanstein castle once you arrive in Hohenschwangau. 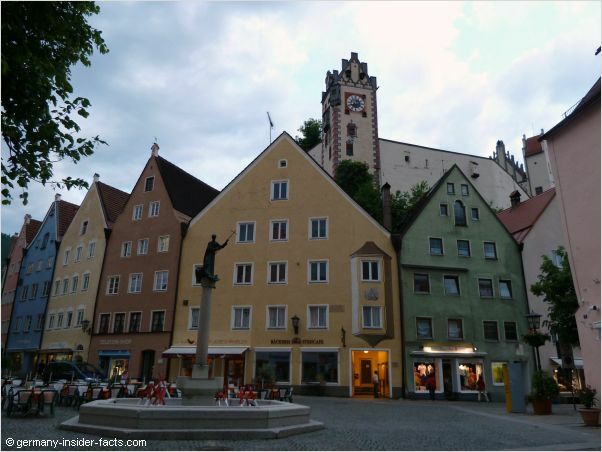 When you walk around in Füssen you will find plenty of restaurants and cafes to relax and recover from sightseeing. There are pizzerias and other international restaurants for your choice. However, try the local cuisine, after all, this is what makes a holiday very special. Pork knuckles, pork roast, rouladen, trout & fishes from local lakes and rivers, dumplings, Schupfnudeln and Käsespätzle give you plenty of choice. 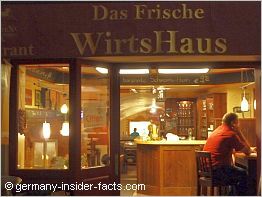 The Wirtshaus zum Hechten (pictured above) is only one of many restaurants that offer delicious local food. On my first visit in the area I stayed in a Hotel in Hopfen am See Germany, right on the edge of Lake Hopfen. The views to the Alps were fantastic. Unfortunately, I didn't bring my camera. Go figure! When you look for a hotel right in the town centre of Fussen, there is plenty of choice. Historic hotels, often owner operated, offer a lot of charm and personal service. 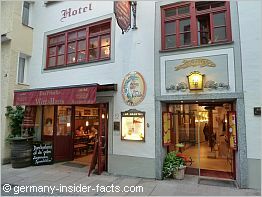 On my most recent visit to Füssen I enjoyed my stay at the Altstadt Hotel Zum Hechten in Füssen. The hotel offers modern rooms, a wellness centre with sauna & spa and a friendly service. The Hechten is right in the town centre within the mall, you can easily walk every where. Travellers who arrive by car can park at the rear of the hotel, fairly convenient. 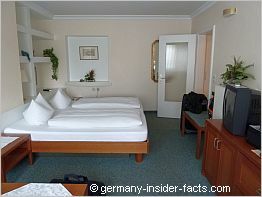 To check all hotels available, just type your dates in the search box to the right and find a great hotel in Fussen. Here is a map of the city centre with the names of the main streets. 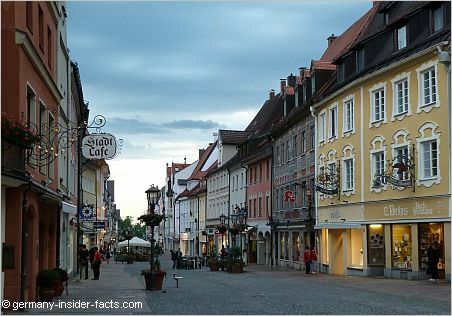 Füssen's pedestrian malls with shops, restaurants and comfortable hotels. It is a pleasure to stroll around the streets and lanes. Füssen and the surrounding areas offer so many activities and attractions. It is really worth to stay a couple of days in this pretty town. How to get to Fussen? Füssen is located at the southern end of the A7 motorway which runs from the Danish border in the north to the Austrian border in the south. So it is easy to get here from major cities in the north. There is a bus connection along the scenic Romantic Road from Frankfurt & Würzburg to Füssen. The RVO Oberbayern buses connect the city with major attractions to the east, like Oberammergau, Garmisch-Partenkirchen etc. However, the longer the distance, the more you have to change buses. Direct regional trains from Munich and Augsburg to Fussen run every two hours. There are a other connections as well, but you have to change trains. Buchloe and Bissenhofen are the main train hubs in the area, they connect Füssen with the Allgäubahn. Read traveller reviews about Füssen Hotels at Tripadvisor. open Monday to Friday from 9am to 6:30pm, Sat from 10am to 2pm and Sunday from 10am to 12 noon.